Add a personal touch to your gift this holiday season with an engraved name plate for just $18.95! 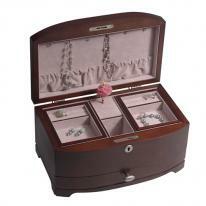 Engraved name plates are available for ALL of our jewelry boxes, armoires, music boxes and watch boxes. 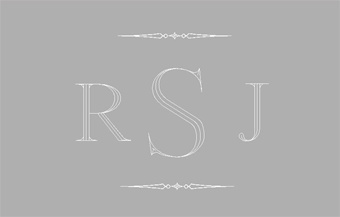 Choose from two colors, brass or nickel and two font styles, script or block. 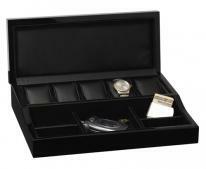 Up to 23 letters can be engraved.Select to engrave initials (1-2 letters), monogram (3 letters) or a message (up to 23 letters). Nickel and brass nameplates are backed with commercial adhesive and ship separately from most products so you can choose the placement of the name plate. 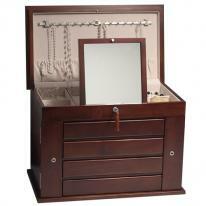 Engraved nickel name plates are free with the purchase of all jewelry boxes, chests and valets by JewelKeepers. 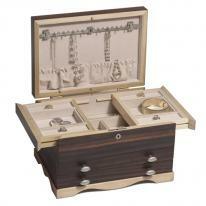 Crafted from American hardwoods, their jewelry boxes are superior in quality, construction and design. 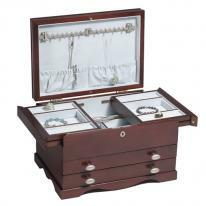 Founded upon the desire to create the best jewelry boxes available on the market, JewelKeepers developed key elements to produce heirloom quality chests to treasure for years to come. Prices range from $179 - $750. 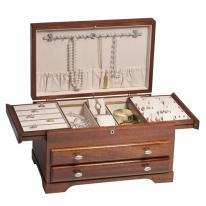 Many of their women's jewelry box are crafted with patented secure lock designs that lock all parts of the jewelry box (top, sides and drawers) with one key.